These were the first words spoken by the Lord Jesus on the Cross. 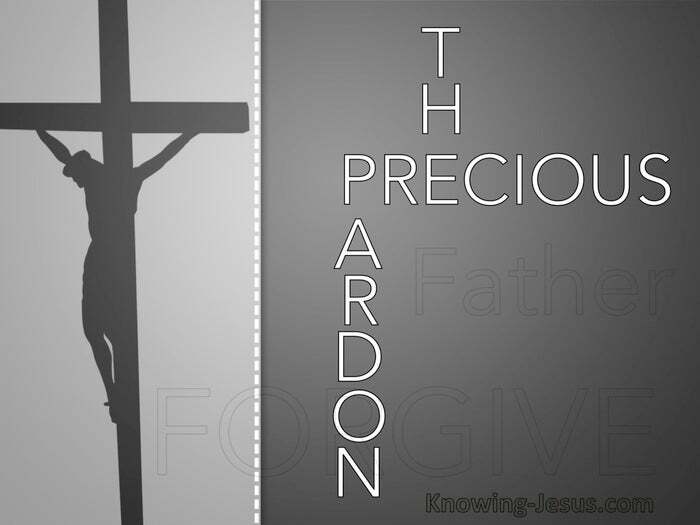 Forgiveness was the first thought on the mind of the crucified Saviour. Forgiveness was the first response of God to sins committed in the Eden. Forgiveness is an unfathomable grace that is deep in the heart of God. These sublime words were uttered at the very act of His crucifixion on the cross.. as the cruel nails, were driven into His hands and feet – piercing His sinless flesh – and He uttered ‘forgive’ – at a moment of excruciating and inconceivable anguish. He emitted no cry of pain, nor any foul offensive execration upon His persecutors. He begged no release from His suffering. There was no bitter curse on His accusers.. Father forgive; Forgive; FORGIVE. Father forgive them, for they know not what they do. He prayed for His pitiless murderers. He prayed for His aggressive accusers. He prayed “forgive“– and for every man born of woman and every woman begotten of man He prayed – forgive. He may as well have called out your very name and mine, in that mighty list of absolution, for His prayer traversed the centuries. His absolution touched every child of Adam. This eternal substitute was made sin for us – for you and for me – and He went to the cross alone. This God-Man paid the price for our every sin and He suffered. He paid the penalty that we should pay. He took the punishment we should receive – for the wages of our sin is death : Death : DEATH, but the gift, in the person of a slain Messiah.. the gift of God is eternal life. And we who believe are both reconciled and accepted in the Beloved Son, forever. His forgiveness traversed the centuries of time. His forgiveness spanned the extremity of the universe. His forgiveness flowed down into the bowels of the earth.. to Hades, to Abraham’s bosom – to the place of the dead. His forgiveness tore down the veil to the Holy of Holies.. and the wall of partition was removed – FOREVER. His prayer encompassed you and me – as His life giving love flowed.. streaming like great drops of blood and water. His prayer washed our bloodied, bruised, battered, ugly, sin-stained hearts. This is “His-Story” – the only thing of account in History. This pivotal point in HIS-Story, which flooded the far reaches of creation.. as fallen man was saturated with God’s forgiveness. This centralized fulcrum in the affairs of mankind – spans past time and through eternity. There is now no condemnation to we who are in Christ Jesus the Lord .. None – None – NONE. What a lesson in gracious forgiveness are these precious words – precious words from our precious, forgiving Savior. Father forgive them, for they know not what they do. He prayed for those that despised and rejected Him. He prayed for those that hurt and abused Him. He prayed for those that grieved and murdered Him – and He loved those that loved Him not. We too should pray for those that despise and reject us. We too should pray for those that hurt and abuse us. We too should pray for those that grieve and harm us – and we too should love as He loved. This is not mere choice. This is a command, the new commandment. A new commandment I give unto you that you love one another.. John 13:34. Love as I have loved you. There are some fragrant trees that bathe a sweet perfume… on the very axe that strikes them, and we too should show only sweet tender forgiving love, to those that hurt or harm us – to those that grieve or pain us. 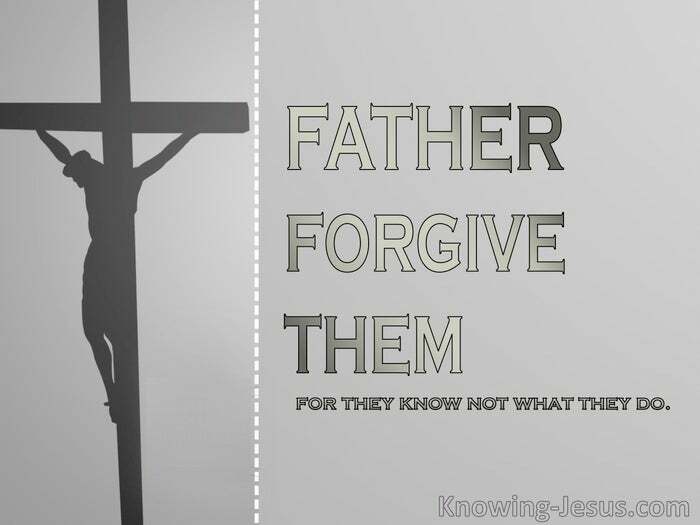 Father forgive them – for they don’t know what they are doing.